Let's do something funny for Money!!! 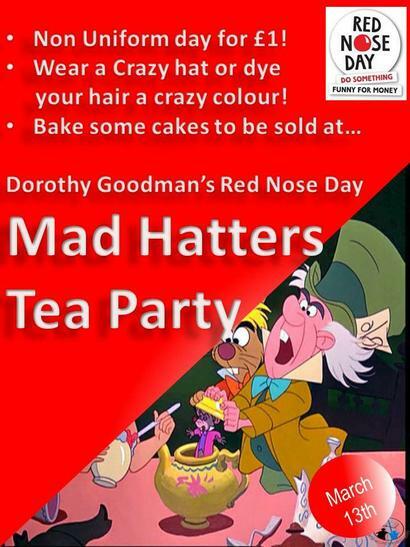 On March 13th Dorothy Goodman will be supporting Red Nose Day with a Mad Hatters Tea Party. It will be a Non Uniform day (for a £1 donation to comic relief), like every Mad Hatter we would like our students to create a crazy hat or dye their hair a funny colour. Also for those great British Bakers out there we would like to sell cakes on the day. So if you fancy yourself a Mary Berry or Paul Hollywood please join the party!! !